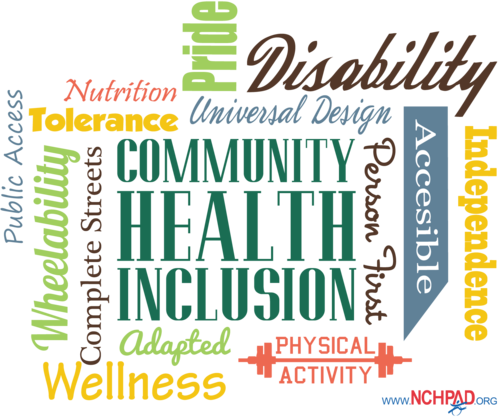 Community Health Inclu­sion, a term that describes disability-friendly environments where people with disabilities have access to the same programs and services associated with being as physically active and eating as well as the rest of the community. Many communities across the country have participated in a change process to improve the health and health outcomes of their communities, yet more and equal effort is required to address the health barriers and needs of people with disabilities. Research shows that the estimated 56 million Americans with disabilities are not only at greater risk of developing serious health conditions associated with sedentary lifestyles, such as diabetes, obesity, and heart disease, but also face greater environmental barriers that inhibit their access. Coupled with health promotion initiatives that are inaccessible and seldom target improving the health of people with disabilities, the low activity status of people with disabilities is a concern. The lack of guidance and translation of inclusive practices makes this an issue of public health concern. During the first full week of April each year, the American Public Health Association observes National Public Health Week. This is a time to recognize and highlight successes and areas of need for improving our nation’s health. This year is a focus on guiding communities through the evolving public health system with the theme “Public Health: Start Here.” As this week sparks discussion and action towards the evolving public health systems to improve the health and wellness of the entire community, we invite you to embrace the term Community Health Inclusion. A well-planned, livable community is one that makes the right choice the easy choice by including people of all abilities! Institute a Complete Streets Policy. Complete Streets refers to streets and roadways that are designed and operated to enable safe, attractive and comfortable access and travel for all users, including pedestrians, bicyclists, motorists, wheelchair users, and public transport users of all ages and abilities. Adopt Safe Routes to School (SRTS) programs that improve the health and well-being of children by providing safe, accessible routes for walking, wheeling and biking to school. Provide an Accessible Playground for everyone to play on, regardless of ability. Start an adaptive sports program with equipment loans for individuals with disabilities and training facility time for competitive athletes with disabilities. For more guidance on building and sustaining inclusive healthy communities, refer to the Community Health Inclusion Sustainability Planning Guide. To get involved with efforts to establish Inclusive Health Coalitions (IHCs) making lasting change in communities nationwide, contact NCHPAD.